Students take a total of five courses during the year — two courses one semester and three courses in the other semester. All students are required to enroll in an independent tutorial with a faculty member in both semesters. For more specific information about courses, view the courses section. Brandeis faculty are deeply invested in the post-baccalaureate program. They are practicing artists who are familiar with the field and also committed to educating the next generation of artists. An important aspect of this program is the many opportunities for students to interact with the faculty. On a weekly basis, post-baccalaureate students gather with faculty to present and discuss their work at various stages in its development. Two to three students present their work every week in these sessions. These critiques are informal but are considered integral to the communal and creative exchange of the program. They allow students to practice discussing their work in conversation with others and learn relevant discourse in relation to their work and its historical context in a contemporary landscape. Part of the curriculum includes studio visits with both Brandeis faculty and visiting artists that come to campus throughout the year. These individualized studio visits allow students to get comfortable receiving critique in his or her studio. Furthermore, with six to eight visiting artists a year, students have a wide range of input on their work and receive many valuable perspectives. 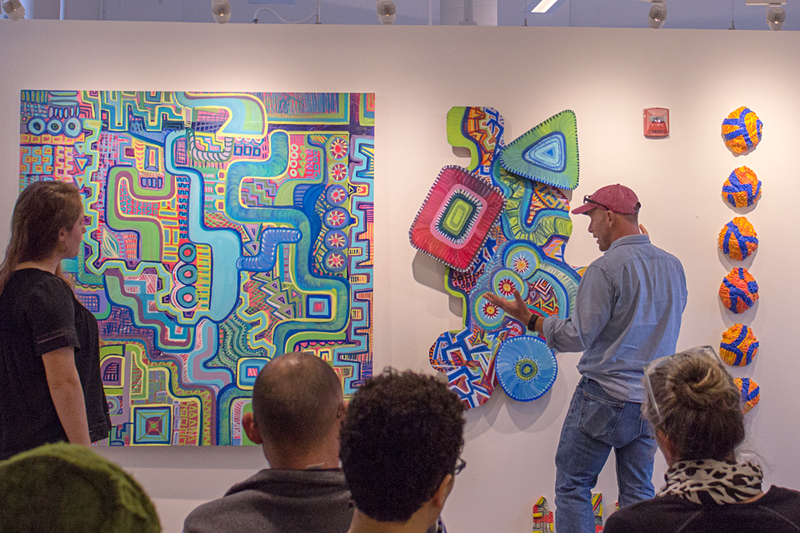 Faculty and visiting artists give lectures about their work and its recent developments. Additionally, post-baccalaureate students are invited to attend the many art-focused lectures happening around campus. Check out past artists who have come to Brandeis. The Rose Art Museum also hosts many well-known contemporary artists. At the end of every semester, students present their work for a full faculty review. A visiting critic also participates in these reviews. In the spring, students exhibit their work in the Drietzer Gallery, located on campus in the Spingold Theater Center. Additionally, students are encouraged to participate in the university-wide Bernstein Festival of the Creative Arts, which provides exhibition, lecture, and other creative opportunities. Once a semester, post-baccalaureate students travel to New York City, Philadelphia, Washington DC, or other areas rich in contemporary art. Accompanied by a resident faculty member, students visit museums and galleries as well as artists’ studio visits. These trips allow students to understand the context of their work and how it relates to the contemporary art landscape. The Rose Art Museum is located right on campus and an invaluable resource to post-baccalaureate students. The collection numbers more than 8,000 objects and is particularly strong in American art of the 1960s and 1970s, including works by Willem de Kooning, Jasper Johns, Roy Lichtenstein, Morris Louis, James Rosenquist, and Andy Warhol. Recent acquisitions have included works by Bruce Conner, Mark Bradford, Charline von Heyl, Jack Whitten, Chris Burden, and Al Loving. Students can take advantage of Rose Art Museum’s scheduled programming, including lectures by exhibiting artists and curators.